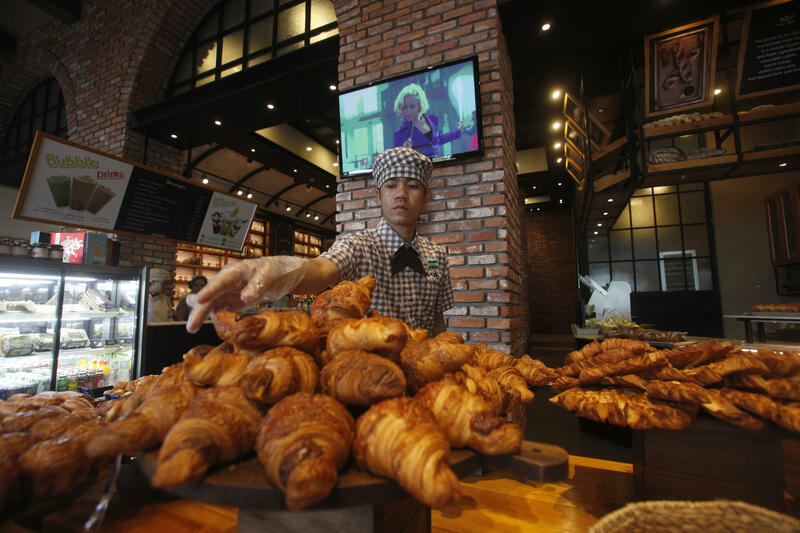 A man arranges croissants at a bakery of CBM Corporation in Phnom Penh August 28, 2014. “We now know that the people who designed potato chip bags didn't make them noisy for the sake of the chips. They made them noisy for the sensory experience,” Pashman says, “They understood that a noisy food was better complemented with a noisy package. And in fact research has shown that if people hear the sound of that packaging being crumpled while they're eating the chips, they will think that the chips are crisper, crunchier, fresher, better only because that sound is being played in the background." One chef in London has begun taking advantage of this hearing-tasting connection and now serves up an iPod with ocean background noise along with his shellfish. Different sounds, or even different sound levels, have different ways of enhancing or detracting from taste experiences. “Research shows that when you're surrounded by very high decibel level, your taste perception goes down. So loud music means the food will have less flavor. It also it works the same in an airplane where you have a high decibel level. And that's one of the reasons why you get less taste perception on an airplane,” Pashman says. Listening to food also clues you in on important information when you’re preparing food. Some chefs can tell whether food is being properly cut by the sound of the knife on a cutting board. And even amateur cooks can tell whether or not a piece of bacon is cooking by the sound of a sizzle in a pan. Pashman says sound can also give you information about the quality of certain ingredients. Sound isn’t the only sense that adds to an eating experience. Different types of music can also change the way the tastes of complicated types of food are perceived. “When you have a food like a dark chocolate or a coffee that has a lot of varying and complementary or even contrasting notes like sweetness and bitterness, it can be hard for your brain to make sense of it all and to latch on to something. And these different pitches of sounds and of music sort of act as ways to highlight certain features of a food,” Pashman says.